Events in the year 1979 in Brazil . Ernesto Beckmann Geisel was a Brazilian Army officer and politician, who was President of Brazil from 1974 to 1979, during the Brazilian military government. 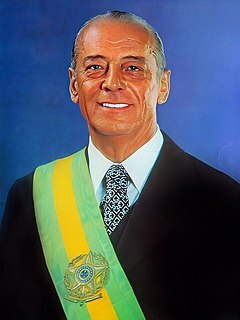 João Baptista de Oliveira Figueiredo was a Brazilian military leader and politician who was the 30th President of Brazil, the last of the military regime that ruled the country following the 1964 coup d'état. He was chief of the Secret Service (SNI) during the term of his predecessor, Ernesto Geisel, who appointed him to the presidency at the end of his own mandate. He took the oath of office on March 15, 1979, serving until March 15, 1985. José Sarney de Araújo Costa is a Brazilian politician, lawyer, and writer who served as 31st President of Brazil from April 21, 1985 to March 14, 1990. At age 88, he is the oldest living former Brazilian president, and, as of the death of João Figueiredo in 1999, the only living former president not elected by direct vote. 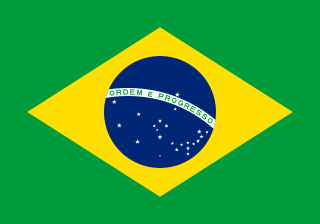 The Brazilian Democratic Movement is a Brazilian centrist political party. The Brazilian Football Confederation is the governing body of football in Brazil. Founded in 1914 as "Confederação Brasileira de Desportos" change name in 1979. During this period, was the governing body, or at least the international reference, also for other sport, like tennis, athletics, Swimming, Waterpolo, Handball. The Brazilian military government was the authoritarian military dictatorship that ruled Brazil from April 1, 1964 to March 15, 1985. It began with the 1964 coup d'état led by the Armed Forces against the administration of President João Goulart—who, having been vice-president, had assumed the office of president upon the resignation of the democratically elected president Jânio Quadros—and ended when José Sarney took office on March 15, 1985 as President. The military revolt was fomented by Magalhães Pinto, Adhemar de Barros, and Carlos Lacerda, Governors of Minas Gerais, São Paulo, and Guanabara. The coup was also supported by the Embassy and State Department of the United States. The Supreme Federal Court is the supreme court of Brazil, serving primarily as the Constitutional Court of the country. It is the highest court of law in Brazil for constitutional issues and its rulings cannot be appealed. On questions involving exclusively non-constitutional issues, regarding federal laws, the highest court is, by rule, the Superior Court of Justice. Marco Antônio de Oliveira Maciel is a Brazilian politician, lawyer and law school professor who served as the 22nd Vice President of Brazil from 1 January 1995 to 31 December 2002, twice elected on the same ticket as center-left President Fernando Henrique Cardoso in the 1994 and 1998 general elections. He was a founder of the conservative PFL party, former ARENA. The 1964 Brazilian coup d'état was a series of events in Brazil from March 31 to April 1 that led to the overthrow of President João Goulart by members of the Brazilian Armed Forces, supported by the United States government. The following day, with the military already in control of the country, the Brazilian Congress came out in support of the coup and endorsed it by declaring vacant the office of the presidency. The coup put an end to the government of Goulart, also known as Jango, a member of the Brazilian Labour Party, who had been democratically elected Vice President in the same election in which conservative Jânio Quadros, from the National Labor Party and backed by the National Democratic Union, won the presidency. Ramiro Elísio Saraiva Guerreiro was a Brazilian politician and diplomat. Guerreiro served as minister of external relations from March 15, 1979, to March 15, 1985, under Brazilian president João Figueiredo. Before this, Guerreiro was general secretary of foreign relations in the government of military leader, President Ernesto Geisel, from 1974 until 1978. The National Institute for Space Research is a research unit of the Brazilian Ministry of Science, Technology and Innovation, whose main goals are fostering scientific research and technological applications and qualifying personnel in the fields of space and atmospheric sciences, space engineering, and space technology. While INPE is the civilian research center for aerospace activities, the Brazilian Air Force's General Command for Aerospace Technology is the military arm. INPE is located in the city of São José dos Campos, São Paulo. Events in the year 1918 in Brazil. Events from the year 1894 in Brazil. Events in the year 1967 in Brazil. Events in the year 1969 in Brazil. Events in the year 1956 in Brazil. Events in the year 1990 in Brazil. Events in the year 1985 in Brazil. Events in the year 1974 in Brazil. The following article presents a summary of the 1979 football (soccer) season in Brazil, which was the 78th season of competitive football in the country. This is a list of Brazilian television related events from 1979. Wikimedia Commons has media related to 1979 in Brazil . This article article about the history of Brazil is a stub. You can help Wikipedia by expanding it.